My latest photography challenge was to take close up photos of some of my three dimensional jewelry. I experimented with black, white, and lavender background fabric and was surprised the lavender was the best. The white fabric wasn’t enough of a contrast, and the black fabric seemed too much of a contrast in the bright sunlight. I love the few little blue rhinestones on the hanging ball in the first photo- they’re a bit mysterious. I bought this at Decades Vintage years ago after working long hours as a paralegal during a trial. 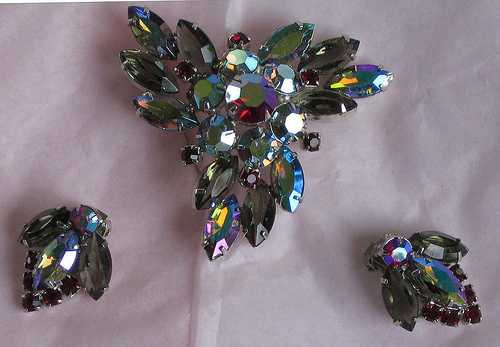 The photo captured the iridescence of the aurora borealis rhinestones, and a fairly good representation of the ball. In the second photo, below, this elegant choker and earrings parure was made by House of Schrager, a high end costume jewelry maker from 1925 to to 1960 or so. 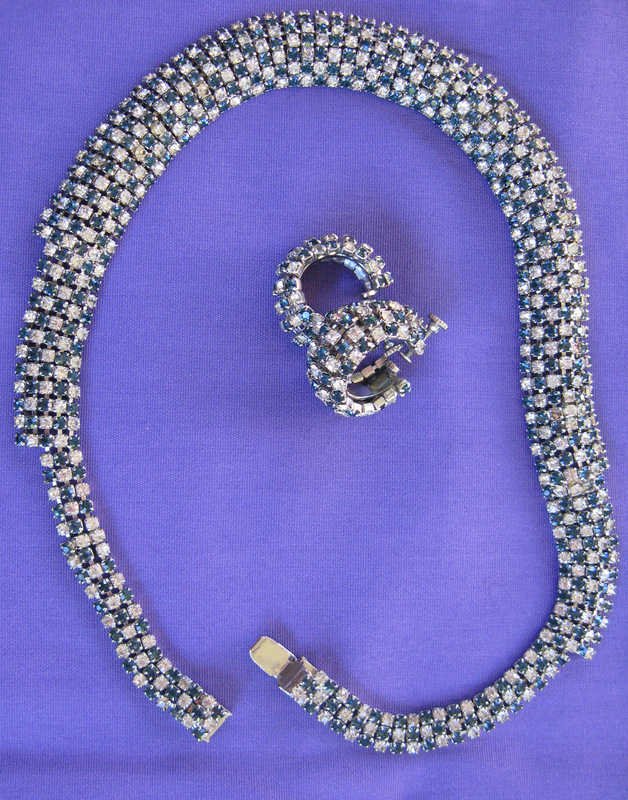 The rhinestones are clear and sapphire colored, and the shape of the choker is really interesting. It’s rounded, not flat, and moves in a liquidy way, rather than rigidly. It’s really beautiful. I bought this at Xtabay Vintage, one of my favorite stores. 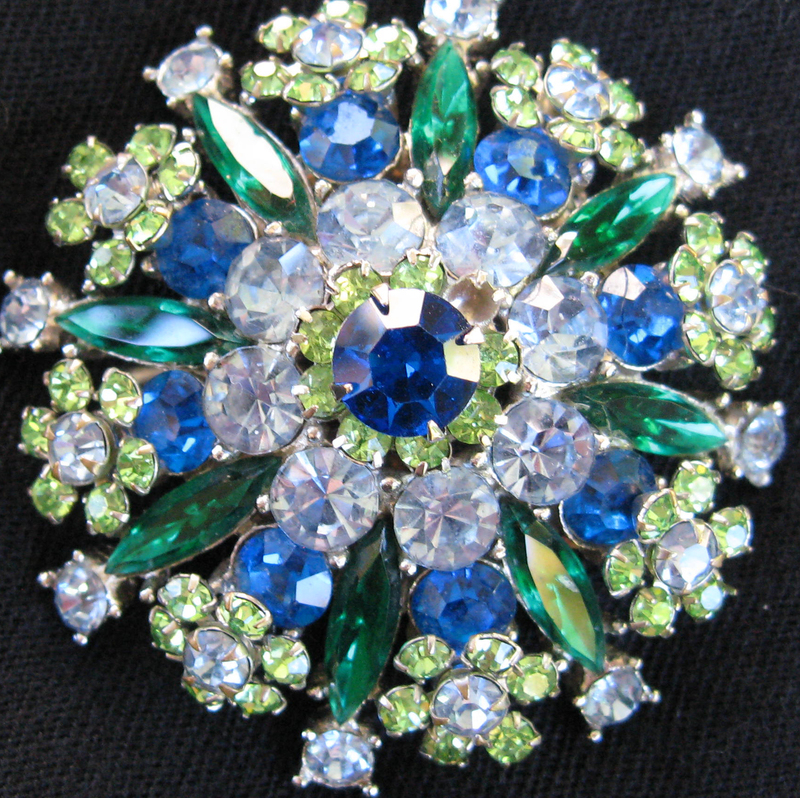 The third photo is of a brooch that belonged to my grandmother. It’s special to me because she gave it to me, and because it escaped that fate of much of her rhinestone jewelry – she took her jewelry apart to make Christmas trees on velvet! I need to work on this one – it’s a bit overexposed and blurry. The last photo is of a wonderful, very dimensional bracelet I purchased at Uncommon Objects on South Congress in Austin. It’s not marked but has all the hallmarks of being a DeLizza and Elster piece – the five link and band construction and the rivets on the back. The metal is japanned silver, which looks grey. But where was the fancy jewelry? The Duchess of Cambridge wore a beautiful gown at her wedding to Prince William. I thought the lace sleeves and overlay and fitted shape were very flattering and beautiful. The Royal’s website has more information about the handmade lace and more details about the dress. I was surprised to see how little jewelry Catherine wore. She wore a pair of small but pretty earrings from her parents, and her ring. I didn’t notice any other jewelry. Maybe it’s a British thing – too much sparkle may be déclassé. Princess Diana didn’t wear much jewelry on her wedding day, either. If I were a duchess, or even very wealthy, I’d buy the jewels first and then design the dress. I’ve always wanted a full parure, or matching set, of jewelry. In my case, a rhinestone parure would be perfectly lovely. Parures were popular among royalty and the wealthy in the 17th century. They were often created with the idea that the stones could be interchanged – rubies one evening, emeralds the next. 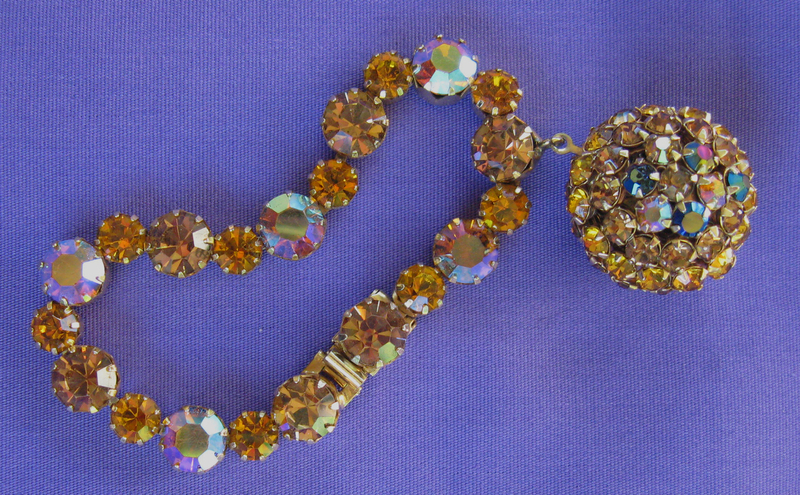 This citrine parure was sold at auction in London in 1999. 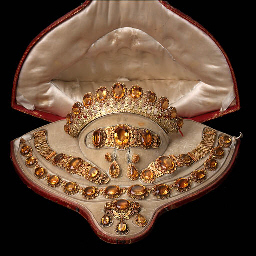 Christie’s website notes that it consists of “a diadem, necklace, detachable brooch pendant with three detachable drops, a pair of bracelets with a detachable central section to form a choker, and a pair of pendant ear clips.” I had to look up “diadem” – it’s a crown of sorts. I think everything at once might be overkill, but the diadem, necklace, a bracelet, and earrings would look very pretty with a plain outfit. 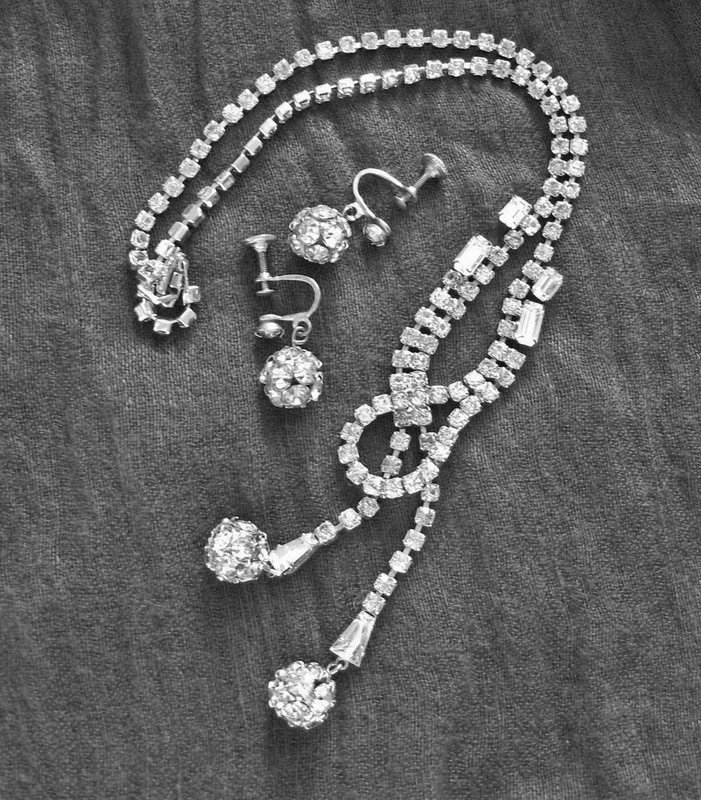 In the world of vintage costume jewelry, a parure consists of at least three pieces of matching jewelry, for example a necklace, a bracelet, and a pair of earrings. More common is a demi-parure, which is two pieces, often earrings and a brooch. I’ve selected two of my favorite vintage demi-parures to show you.